Right here in Hastings live two women who have gone and put themselves out there to organise events of not only regional interest here in Hastings but national! 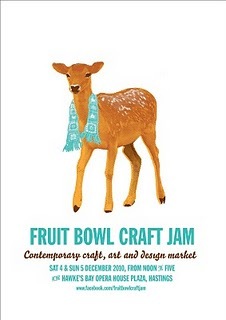 In December they started Fruit Bowl Craft Jam which, over the two days it was held, proved to be a phenomenal success for Hawke's Bay Makers. Then they saw a need and on 22nd March - the month anniversary of the Christchurch Earthquake which saw so many people displaced and lives lost - the Craft Jam for Christchurch was held. This was an amazing evening of auctions, craft stalls, wine and socialising to raise money for the appeal, all with a civil defence type of theme. Stalls were set up in suitcases and trunks. Jo and Jess you are an example to us all of what can be done with a little imagination and a whole lot of give it heaps!